Phil Ochs had about 70 songs published in the 1960's and 1970's in Broadside, the National Topical Song Magazine, published in New York City by Sis Cunningham and Gordon Friesen. Vic Sadot met and interviewed Phil Ochs in May of 1973 as the Watergate scandal was beginning to take its toll on the Nixon administration. In 1982 Vic Sadot was asked by the aging and ailing Gordon Friesen to write an article in review of the more than 400 pages of FBI files that were released to him under the Freedom of Information Act. The article was published in Broadside magazine and in the Delaware Alternative Press in 1982. I knew that I was learnin' that I ain't a'marchin' anymore! Over 400 pages of FBI memorandums on folk singer Phil Ochs were released to Gordon Friesen and Sis Cunningham, publishers of Broadside topical song magazine since 1962. They used the Freedom of Information Act to obtain the FBI files on one of their most prolific contributors. These files show that the FBI began surveillance on the folk singer early in his career until his death in 1976. A New York Office memo labeled "unclassified" but "confidential" reports that "Mainstream (magazine), Aug. 1963, on page 34, contains a poem entitled 'Glory Bound' by Phil Ochs and an article, 'The Guthrie Legacy'." In the early '60's a folk song movement burst out of the Greenwich Village (New York City) coffee house scene to claim national attention. Woody Guthrie, the "Dustbowl Balladeer" and union movement singer, was the hero and inspiration to a whole new generation of singer-songwriters. Guthrie wrote such well-known songs as This Land Is Your Land and Goin' Down That Road Feelin' Bad. Phil Ochs wrote a tribute to Guthrie titled the same as Guthrie's autobiography, Bound for Glory. Phil Ochs grew up in Columbus, Ohio. He became an activist at Ohio State University as his awareness expanded in the climate of questioning aroused by the Civil Rights movement and the Cuban revolution. He quit college when he came up against censorship of campus publications which he edited. Ochs moved to Greenwich Village where he performed his own songs and befriended such talents as Bob Dylan, Eric Anderson, Dave Van Ronk, and Tom Paxton. Most of his songs were topical and controversial enough to cause the FBI to enter into its files: "Records of the Insurance Office of the American Federation of Musicians, Local 802, 261 West 52nd St., NYC, were checked on 10/28/63 by (blacked out, of course) and they reflect that Phil Ochs joined Local 802 3/13/63 as a guitarist." Ochs appeared at the Newport Folk Festival in 1963 when Sis Cunningham and Gordon Friesen of Broadside persuaded Pete Seeger to include Phil in one of his workshops. It was an important opportunity for the young folk singer. Ochs was soon recording, and songs like I Ain't Marching Anymore, Draft Dodger Rag, Outside of a Small Circle of Friends, Changes, and Love Me, I'm a Liberal found an audience of millions. Throughout the late '60's Phil Ochs sold out large concert halls across the country, including Carnegie, even though he was virtually excluded from TV and most commercial radio stations. Beyond any doubt, he also became the traveling troubadour of the anti-war movement as he appeared at major rallies from coast to coast. Another FBI memo reports back to Headquarters: "On Oct. 15, 1965 Special Agents of the FBI observed Phillip Ochs in Philadelphia, Pennsylvania as he sang topical folk songs at a street rally protesting the U.S. participation in the war in Vietnam." After a blacked out paragraph, the report continues: "During the rally, Ochs mentioned that he was appearing at that time at the Second Fret, a night spot and coffee house in Philadelphia." The report doesn't say whether the agents dropped by for the show. As the Vietnam war dragged on year after year and thousands of American men were sent home in body bags, the domestic opposition grew to a majority of Americans. A large demonstration outside the Democratic Party Convention in Chicago in 1968 was attacked by police, and after CBS reporters were clubbed and had their cameras smashed, a shocked Walter Cronkite wondered aloud if it was not a "police riot". One Ochs FBI file reports that he participated in a comic incident by the Youth International Party (Yippies!) during the convention: "At 10:20 am it was observed that a live pig was brought to the Plaza by the YIP contingent, which they announced was the YIP 'candidate' for President of the United States. When efforts were made by the Chicago Police to bring the pig under control, 7 Yippies attempted to intervene and were arrested by the police. 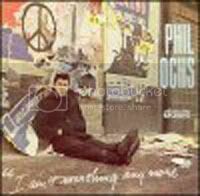 One of those arrested was Phillip Ochs, a white male, born December 19, 1940." The government attempted to put the diverse leadership of the American anti-war movement on trial on charges of "conspiracy to cross state lines to incite a riot." They were popularly known as "The Chicago 8" until Black Panther Party leader Bobby Seale was removed from the case and they became "The Chicago 7". Seale was bound and gagged and tied to a chair by order of Judge Hoffman because he repeatedly demanded to be represented by an attorney of his own choice. Ochs testified at the trial which lasted several months. It was the government's way of tying up scarce funds and experienced leadership of the movement. There is an FBI memo labeled "SECRET" dated 10/1/68 which directs FBI agents: "During your investigation remain particularly alert to subject's writings and public statements which would indicate his attitude toward violence to attain anti-United States objectives." Ochs had moved to California, and the Los Angeles FBI office responded on 12/20/68: "A suitable photo of the subject is being recommended for inclusion in the Security Index." Earlier FBI memos had recommended that Ochs be placed on the "Reserve Index". Subsequently, Ochs was put on the Security Index when a form letter signed by FBI Director J. Edgar Hoover was sent to FBI offices around the country. Box #3 was checked: "Because of background is potentially dangerous; or has been identified as a member or participant in communist movement; or has been under active investigation as a member of other group or organization inimical to U.S. Photograph enclosed." 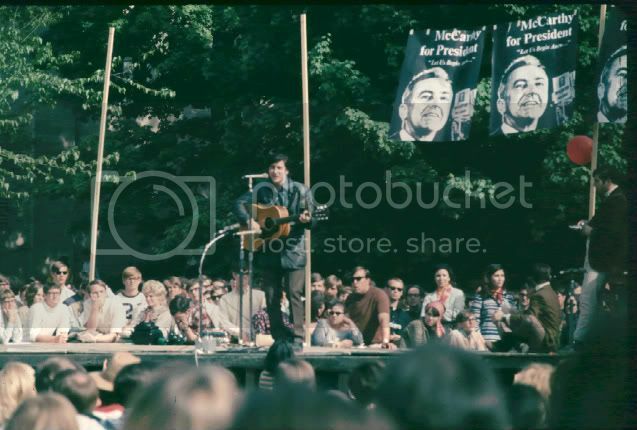 Phil Ochs at a 1968 rally for Eugene McCarthy, the anti-Vietnam War candidate of the Democratic Party. Photo by William Curtis who was a grad student there at the time. The Little Rock, Arkansas FBI office responded on Oct. 22, 1969 with a memo titled "Threat Against the President". The report claims that a mother turned in an Ochs record which was purchased by her "14 year old son, Stanley Thomas, at Osco Drugs, S.W. Shopping Center, L.R." It reads: "This record was monitored on Oct. 20, 1969 and on side one the first song, entitled Pretty Smart on My Part states in song what appears to be: 'I can see them coming. They're training in the mountains. They talk Chinese and they spread disease. They wanna get me. They wanna hurt me. They wanna bring me down. But some time later, when I feel a little better, we'll assassinate the President and overthrow the government, and then, we're gonna fry them." Apparently, the FBI agents were not sharp enough to realize that Ochs was making fun of right wing anti-communist paranoid nuts. Each verse in that song mocks paranoia (unjustified fear) from several different angles. Other file reports show that Phil Ochs' travels were closely monitored: "On Oct. 25, 1970, a Special Agent of the FBI observed Phil Ochs and Jerry Rubin depart Kennedy Airport, N.Y.C., for Paris via Air France flight 076, at 10:32 pm." After several blacked out paragraphs, we see a rather curious, perhaps informative, statement: "This document contains neither recommendations nor conclusions of the FBI. It is the property of the FBI, and is loaned to your agency; it and its contents are not to be distributed outside your agency." On this European trip was immediately deported from England with British officials calling him a "communist" and a "traitor", according to his friend Gordon Friesen. The same thing happened in Ireland. So Ochs came home, and years later we find this in his FBI file: "OCHS was personally observed arriving in New York City from Dublin, Ireland on 11/16/70 by (blacked out)." Does this mean that the Central Intelligence Agency caused Phil Ochs' travel rights to be violated? Ochs took a trip to several African countries in 1973. (Note: There are rare recordings of Phil Ochs singing with African groups during this voyage.) One evening, while strolling alone on the beach in Dar es Salaam, Tanzania, three muggers beat him savagely and left him unconscious. Was there any political motive behind this? The attackers ruptured his vocal cords and caused some permanent damage to his singing ability. In 1974, Ochs and several others organized a benefit concert for the Chilean refugees in Madison Square Garden in which Bob Dylan, Arlo Guthrie, Harry Chapin, Melanie, and Pete Seeger performed. His last major project was to produce an album and negotiate a record contract with Warner Brothers for singer-songwriter Sammy Walker in 1975. For the most part, the years 1975 and 1976 were years of disintegration for the once productive singer. Ochs became an alcoholic and was diagnosed a manic-depressive when h e sought treatment. He began calling himself John Butler Train and was involved in numerous hostile confrontations with friends and total strangers. When the manic stage finally subsided, he entered the quiet depressive stage in which he concluded that he had gone too far down the road to run as John Train. This culminated in his death by suicide. He hung himself at his sister Sonny's home in Far Rockaway, N.Y. Since Phil Ochs' death, A&M Records has released an excellent two record collection album of his songs. Unfortunately, a sensationalistic book titled Death of a Rebel opens with and dwells upon the tragic last days and departure of Phil Ochs. It portrays him as a paranoid egomaniac without appreciation for his political and humanitarian commitment. This portrayal is also done without any attempt to acquire and investigate his FBI files. Gordon Friesen wrote a severely critical review of the book for its exploitation of Phil Ochs' suffering and its fabrication of supposed telephone conversations between Sis Cunningham and Phil Ochs. The author, Marc Eliot, never interviewed Gordon Friesen or Sis Cunningham, and would have no way of knowing their phone conversations without tapping their phones. In the book review, Gordon Friesen writes: "We never accepted as paranoia Phil's insistence that the FBI and CIA kept surveillance on him for a number of years. After all, Phil's key participation in the anti-Vietnam War movement had had tremendous impact, influencing tens of thousands to turn against the war-mongers in Washington. It seemed perfectly logical to us that the hawks would utilize the governmental agencies under their control to counteract the influence of the Phil Oches." Thanks to the Freedom of Information Act, this has now been confirmed. However, a stack of FBI files as thick as a big city phone book with more than half of the entries blacked out means that we are only glimpsing the tip of the iceberg. What don't they want the public to know? And leave my life alone! Alternative Press Syndicate and non-profit papers may reprint this article in full with credit to the author and the Delaware Alternative Press and Broadside, the National Topical Song Magazine. Join the Broadside Balladeers group at Last FM to discover and share news about who is writing today and in the past in that progressive anti-war tradition. 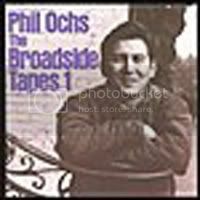 Note: Vic Sadot wrote a tribute song to Phil Ochs in 1977, a little over a year after he died, called Broadside Balladeer.